Safely tying up horses is a prime concern for all horse owners. Here is a neat setup used by buckaroos in the horse barn at the Warm Springs Ranch near Eureka, Nevada. This tie-up gives the horse some freedom of movement for eating and you can move him over in his stall while saddling, yet he cannot become tangled in the lead rope. The danger of his pulling back is also reduced by the angle of the tie-up. 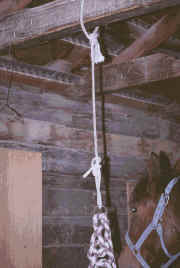 A rope is looped and tied with a square knot over a ceiling beam. A ring, such as an old cinch ring is tied onto the other end using a bowline knot. The total length should be well above the point of a horse's shoulder. A halter's lead rope can then be tied into the ring and daisy-chained to avoid dangling ends. This article was first published in Western Horseman Magazine.